I just got back from my "local" (half hour away...ugh) Best Buy to take a look at the forthcoming Zune HD. I was pretty impressed with what I saw, and I'm definitely looking forward to picking mine up when it comes out. Here are a few things I noticed and thoughts I have about the device, and I'm mostly trying to avoid repeating anything that has been said before. Forgive the short-hand, but I'll try to clean it up later. Now Playing playlists can be saved to the device for later use, and even sent via the Social to yourself or other people to look at later. A keyboard pops up so you can name the playlist. He wasn't allowed to show off Marketplace, Social, or Internet features, since they weren't finished yet. I got to hold the device to feel its heft, and it's surprisingly light. Screen seems very responsive, and the buttons tactile. The "home" button below the screen is slightly beveled, which felt good to press. Notifications pop up at the bottom of the screen, a bit like the "curtain" on the Palm Pre. When you do an action like pin a song or clear a list, it will show up in this area, and not show up as an overlay the way it does currently on the 3.0 firmware. Changing tracks can also be accomplished via a swipe gesture, similar to the one currently used with the Zune Pad. The "twist" interface has been retained (as you've likely seen in screenshots), but anywhere in the main area of the screen can be swiped right or left to accomplish the gesture. The HD dock will not accept the original Zune 30, since it "simply will not fit." Apparently has more to do with size than anything else. All in all, a number of welcome improvements (like saving Now Playing lists, HD radio, and of course the beautiful transitions), and a number of things I hope they'll fix in coming updates. 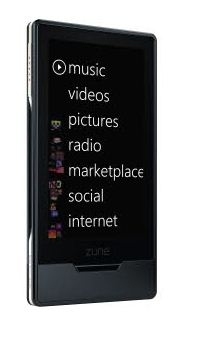 No matter what, this definitely appears to be something the Zune team can be proud of. Great stuff.